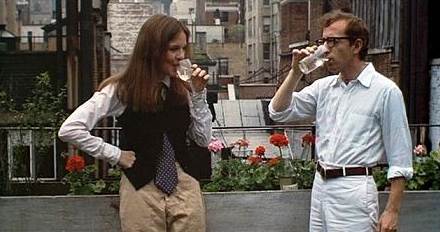 There is that iconic scene in Annie Hall (I use “iconic” because I think every shot in the film that I have seen 2 bagillion times is iconic) that takes place on the day when Annie and Alvy first meet. Annie invites Alvy up to her apartment for some wine “or something”. She grabs any two glasses and goofily tells the story of a dying narcoleptic as she pulls an already-opened burgundy bottle of white wine from a cabinet-chest-type-thing and pours a bit into the glasses. She then sticks the bottle into a planter box full of red geraniums beautifully set against her NYC apartment porch view and sips along with her guest. They chat, and flirt, and feel like idiots, each in their own special way, hoping the other doesn’t notice. And so goes the beginning of an idiosyncratic love affair. I love the scene for so many reasons. But I think about the wine. I always wonder what it is. And why is it sitting in an unrefrigerated cupboard? And why is it already open? Is she hiding it from someone? Is Annie like my mom- taking a week or two to drink the same bottle, sometimes adding ice cubes? Is it disgusting and warm and old? Or had she opened it for a quick glass before going off to play some tennis and meet the funny little man who would change her life? Every detail is considered when a movie is made, right? So the wine must have been considered. Maybe. Maybe Woody just didn’t care, and I am a weirdo because I do. Oh well. La di da. La. Di. Da. And, if you’d like to surf a few wine (and food) waves around the web…here you go! Let’s Start at the Very Beginning- Paul Lukac’s new book. “The local AOC system is based on communes, not terroir, and rewards conformity.” Le Puy & AOC hopes. Burdigala happened at St. Bartholomew’s Church yesterday. Go Bordeaux! You’ve got to read this: The Extraordinary Science of Addictive Junk Food. …and beyond chocolate- a simplified pairing poster (via A Cup of Jo). Handsome Noodle is getting Lucid (and making linguine with tuna sauce). In honor of the 2013 ZAP festival, Cali vine pride, and my ah-hah wine- a blog full of Zinfandel love.